Painted over the course of two weeks in September, prior and during The Unexpected Project: 2016, the triptych sponsored by OK Foods prominently feature a company legend, Gene “Beck” Beckham, and two other locals: Kristina Jones and Edward Paradela. Beckham was associated and worked with OK Foods for more than 70 years, beginning in the 1940s when it was still OK Feeds. The landmark grain towers, which OK Foods calls “finished feed load out towers,” were constructed in the 1960s. A telling sense of pride exudes from Beckham’s expression in the 100-foot-tall mural. Beckham described OK Foods as a “home” to him, where he has been for most of his life. “Only time I was gone was in the service, and then right back to work,” Beckham said. He started out sewing sacks and then unloaded train cars of grain with a shovel. He also worked in maintenance and managed the mill for about 40 years. “Had a lot of boys that worked for me. Hired a lot of boys,” he said. 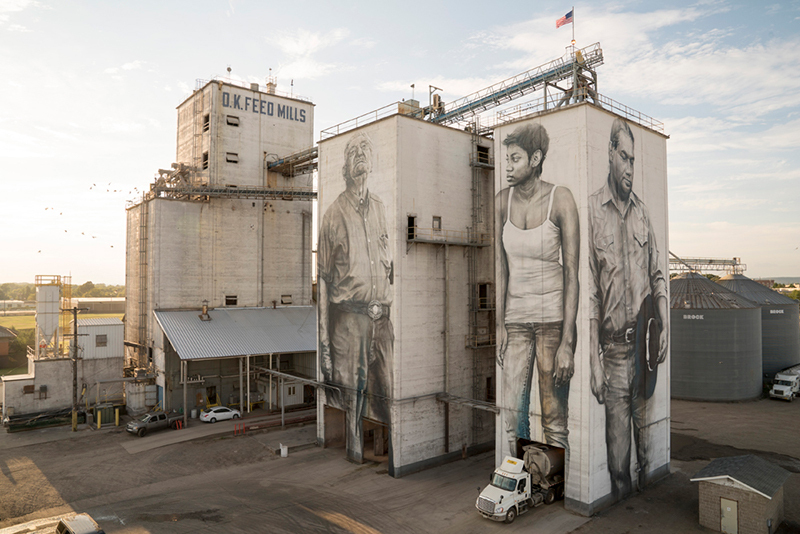 Spanning the generational gaps from one feed tower to the next for the OK Foods triptych murals are a young African-American woman, Jones, and an Apache man, Paradela. Van Helton, who had already gone on to his next project by Thursday, says in a documentary film by fellow Australian Selina Miles that he only travels to certain places to paint, whether it is a town in northern Iceland to paint a portrait on a ferry or to a nuclear ruin at Chernobyl, Russia. Although he may not know exactly where he will be traveling to next, he always aims to capture a feeling from the people and the places in his portraits.